Heavy Duty Upgrade. 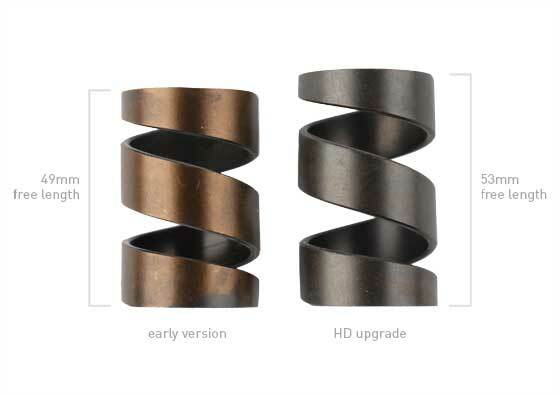 In later model years, Volkswagen upgraded to a longer, heavy duty spring with higher pre-load between 3rd and 4th gears. The new version spring will retrofit into any 113/002/091 trans that uses circlips on the pinion shaft (if your pinion shaft has a nut on the end, you need a solid sleeve instead of a spring). If you aren't sure which spring you currently have, measure the free length. The early version is about 49mm long while the upgraded heavy duty version is about 53mm long. Applications: VW 113/002/091 transaxles with circlips holding 3rd and 4th gears on the pinion shaft.